ISBN 9780193436954. 11 x 7 inches. The Oxford Choral Classics series gathers together over 300 of the world's choral masterpieces into a unique set of anthologies spanning the whole of Western choral literature. 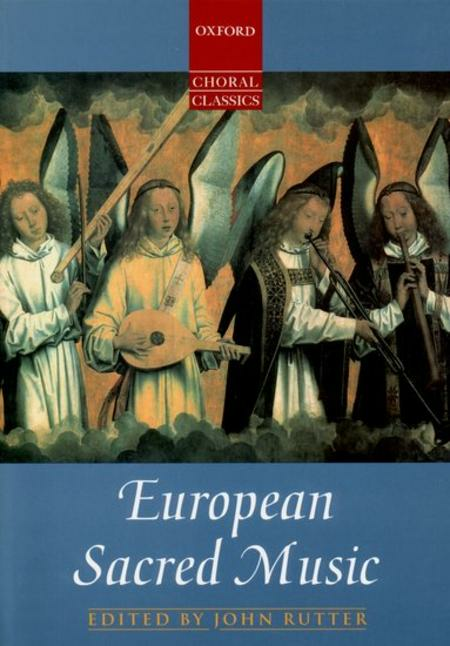 Each volume contains all the established classics of its genre under one cover, in authoritative new editions and at a price that gives fabulous value for money.European Sacred Music is a collection of over 50 of the finest examples of sacred choral music from continental Europe, ranging from the sixteenth to twentieth centuries. John Rutter has prepared completely new editions of all the pre-twentieth-century items, going back to the earliest and most reliable manuscript or printed sources. New English singing translations are provided for most pieces, and playable keyboard reductions.Orchestrations are available for hire for the eight accompanied items (Bach: O Jesu Christ, meins Lebens Licht; Buxtehude: Magnificat; Faure: Cantique de Jean Racine; Franck: Panis angelicus; Gabrieli: Jubilate Deo; Mendelssohn: Verleih uns Frieden; Monteverdi: Beatus vir; Mozart: Ave verum Corpus)Some items from this volume are available separately as leaflets in the Oxford Choral Classics Octavo series. A splendid collection of classics from across the centuries. Impeccably presented, instantly readable. A repertoire in a book for a serious choir.